25TFFN/G H0615-06 High Definition precoated fabric 25mm dome shielded Neo Tweeter £18.95 excl. VAT. 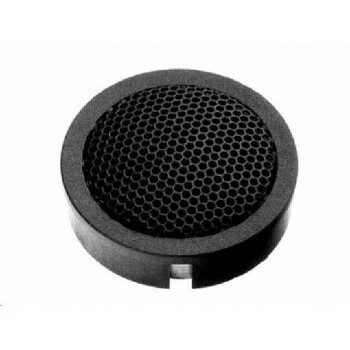 25TFFN/G H615-06 is a High Definition precoated fabric 25mm dome tweeter. SEAS Back catalogue unit. Outstanding response extension, with a powerful shielded neodymium magnet system. A precoated fabric diaphragm with high consistency and excellent stability against variations in air humidity. The diaphragm is protected by a highly perforated hexagrid. A Sonomax surround is used for low resonance and excellent mechanical linearity. Ferrofluid for additional cooling and enhanced power handling. Flexible lead out wires allow this driver to be used with low crossover frequencies. Powerful magnet system based on a high grade neodymium ring magnet for exceptional sensitivity and control. A stiff and stable rear chamber made from extruded aluminum is equipped with cooling fins and black anodized for excellent heat transfer and high power handling. The chassis is precision moulded from glass fibre reinforced plastic, and its front design offers optimum radiation conditions.